Last year I made a necktie cookie pop, and decided to make a small version this year, without the stick. Here's my little template for the neckties. Usually I use a file folder to make templates, but I ran out of them. For this mini template (about 2-inches), and a small batch of cookies, this paper template worked out just fine! As you can see, for the shirt I used a onesie cookie cutter and simply cut off the bottom part once I placed it on the baking sheet. 1. Whip up your favorite batch of sugar cookie dough, or other cut-out cookie recipe. 2. Use a shirt cutter (or onesie cutter & cut off the bottom part of the dough) to cut out your cookies and bake them up. 3. Make a little tie template (size it in relation to the size of your shirt), and bake up some tie cookies too. 4. Let all cookies cool completely. 6. Fill the cookies with royal icing. (I kept the icing white for the shirts.) Let that dry for about an hour. 7. Add the shirt details. For best results, thicken your icing and use a #1 tip. (At first I was lazy and didn't do these two steps.) The details look much better with a thickened icing, and thinner (smaller tip) lines. 8. Let shirt cookies dry overnight. 9. After icing the shirts, ice the ties (Tint with food coloring to make them any colors you fancy). Let the first layer of icing dry for a bit (15-20 minutes) before adding details (stripes, polka dots, etc...). Leave them to dry with the shirt cookies. 10. After the cookies are completely dry, add the ties to the shirts by putting some royal icing (not too thin) on the back of each tie and pressing it firmly, but gently, onto a shirt cookie. 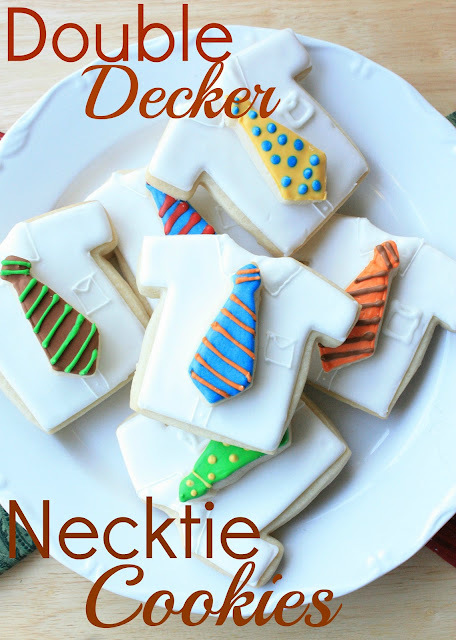 Make these cookies for the dads in your life and they will have a tie-rrific Father's Day! Too cute! Your cookies are always so adorable and inspired! These are so super cute, i love them! Very cute! And I love cookies that allow you to play around with patterns! These are so much fun!! I love your double decker cookie and these are no exception. That little tie is the cutest! I Love it!! Super cute!! *Turned out pretty cute? * These are adorable. Looks like you've been baking a lot of yummy and creative treats! oh my gosh those are adorable!! and perfect for father's day! thanks for sharing! I love your doubledecker/3D creations! So cute. I think Dads out there are going to love them. Wish I'm crafty and have the cookies decorating talents like yours. I love this idea! Thank you so much for sharing it!!! My godness, I love, love these cookies. They are the most adorable little treats ever. These could not be more perfect for our 3 piece suit wearing Dad!! Hugs! You are so talented! I gotta try this for Father's Day -- thanks so much for the great idea! What a great easy project to make for Father's Day. Just pinned it! These are super cute! I hope I have enough time to make them!! So cute! They're perfect Father's Day treats! Very cool and what a smart idea for the shirt. I love new uses for existing cutters. These are adorable! Perfect for father's day. I'd love for you to share over at Whatcha Whipped Up Wednesday Hope to see you there! So cute! These would be soooooo adorable for a missionary farewell too. You are amazing. Lovin' these double deckers and your DIY ties! Fabulous! but also entertained! I'm sure you had fun writing this article. These are amazing! I'm sure anyone would be thrilled to arrive back from work to find these beauties!